Eric Bird served with the Machine Gun Corps from its inception in late 1915. Time and again he was sent to the Somme, witnessing the key battles that raged over this hard-fought area. His memoir was written in 1960s but is vivid in its recollections and particularly its descriptions of the front line and the landscape, something Bird attributes to good memory. Bird is, unsurprisingly, a strong proponent of the use of the machine gun during the war. Whilst critical of some aspects of the organisation of the Machine Gun Corps, and of the belief that machine guns were not used to their full potential particularly early on in the war, overall he provides a convincing argument for their success when utilised correctly. On 1st July 1916 Bird and his men were held in reserve so missed the fighting. Holding the line opposite Serre for twelve days, he witnessed the aftermath of the attacks of the first day of the campaign and describes it in unflinching terms. Seeing the piles of corpses, in a book that generally shies away from passing judgement on the conduct of the war, he is openly critical of the Generals. By his own admission during the Somme campaign he ended up in a fragile state of mind. Deeply affected by the loss of his brother he took unnecessary risks and was wounded in August 1916. Bird does not shy away from accounts of the action and captures the impersonal, almost casual, but destructive fire of the machine guns on the massed ranks of advancing Germans. Whilst sickened by the nature and scale of the killing, he was proud of the victory that was ultimately won. He became Intelligence Officer to the Divisional Machine Gun Officer in January 1918, and details the use of the machine gun in defence rather than attack during the German March offensive. Bird then describes the confusion of this period as the British carried out a fighting retreat with the MGC often bringing up the rear in attempt to stem the German advance. By the time of the final British offensive in 1918 the frustration of fighting again and again over ground so hard won in 1916 is evident. The memoir has been edited but extent of this input is unclear. No additional context about Bird’s life or background is given. The rich detail of the memoir provides an excellent opportunity for cross-referencing or additional contextual information so it is a shame that nothing is provided. 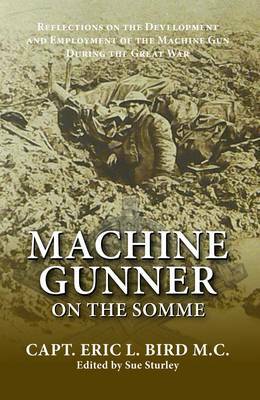 Overall, however, ‘Machine Gunner on the Somme’ provides an excellent account of the use of the machine gun during the war, and shows how it was utilised to great effect on the open landscape of the Somme. Yet the book is also as much about how the Somme itself shaped and defined one man’s experience of the war.